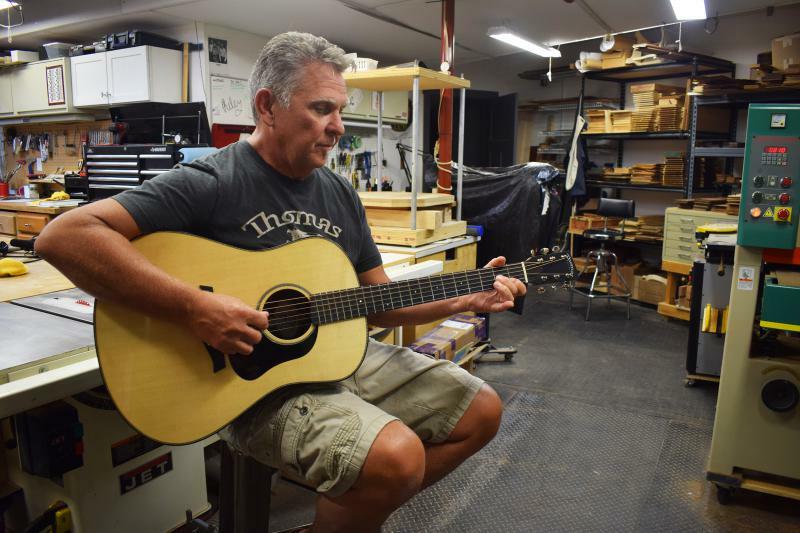 Tom Neal of Hudson inside his Thomas Guitars shop. In the background is his pride and joy: his wood rack. Instead, Neal makes guitars. It’s a natural extension for this lifelong musician who spent a decade playing semiprofessionally on the road in the 1970s and 80s. Thomas Guitars—his hobby-slash-business—is based out of his basement shop at his family’s home in Hudson, north of Normal. “Every time I finish a guitar and string it up and strum it for the first time, it’s like a newborn baby. It’s just so cool. It’s the coolest thing ever. I’ve taken this thing from blocks of wood to a musical instrument that just has so much to offer,” Neal told GLT’s Sound Ideas. Neal is currently working on guitar No. 45, and he’s got enough wood in his shop to make 100 more. But it’s quality over quantity in the boutique, custom guitar market where Neal operates. 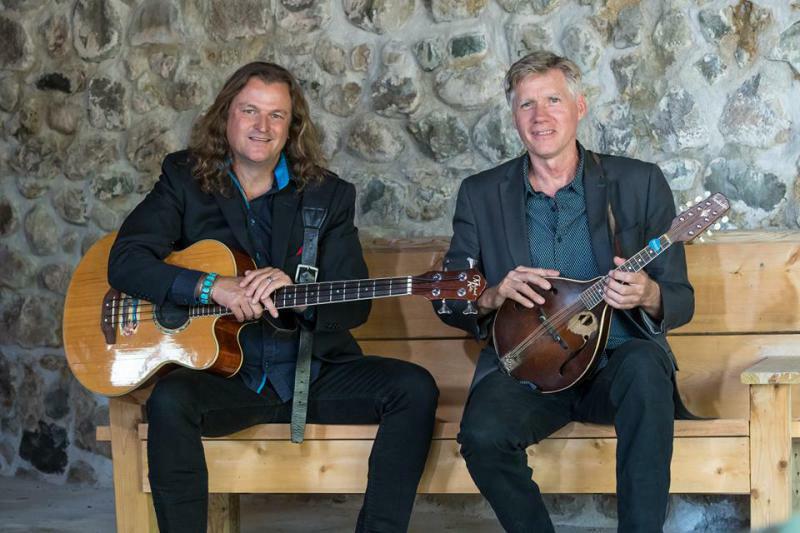 Neal said his customers include a lot of central Illinois musicians—including amateur “Saturday afternoon pickers,” as Neal calls them—who want something a little different than an off-the-shelf Gibson or Martin guitar. His guitars have also won over several professional musicians, including Boston-based Chris Trapper and Miles Nielsen. Neal's shop is filled with all sorts of tools of the trade. There’s a band saw, a chop saw, and a table saw, to name a few. That quality comes at a cost; Neal’s guitars run upwards of $2,000. “The guitar market is really interesting. You’ve got the retail stores that have all the big-name brands—Martin, Gibson, Fender—and people gravitate toward those because they’re familiar with them. So in the custom-guitar world, people are intimidated because they’re usually pretty pricey. The cost to produce one at the level I am is much higher than a manufacturer, obviously. “I’m trying to keep (my prices) down closer to that retail market price. So if there’s somebody who’s been playing for a few years and they want a really good guitar and they want something a little different, that’s kind of the niche I’m working in right now,” Neal said. Neal found his hobby years ago when he spotted a guitar he wanted but couldn’t afford. So he bought a kit to build a version of it himself. Enjoying it, he then tried making a guitar with his own wood—no kit. Then family and friends started asking him to take orders. Thomas Guitars was born. Neal went to school for graphic design, and when he’s not making music—or guitars—Neal is an art director at State Farm. His wife, Breann, also works at State Farm as a video producer. They’re musical partners too, performing out a couple times a month. And their basement is itself a venue—with a bar area, pool table, and small stage they use for house concerts. "I want people to play my guitars when I build them. That's why I build them. Not to hang them on the wall." That’s just steps away from Neal’s shop, which is filled with all sorts of tools of the trade. There’s a band saw, a chop saw, and a table saw. 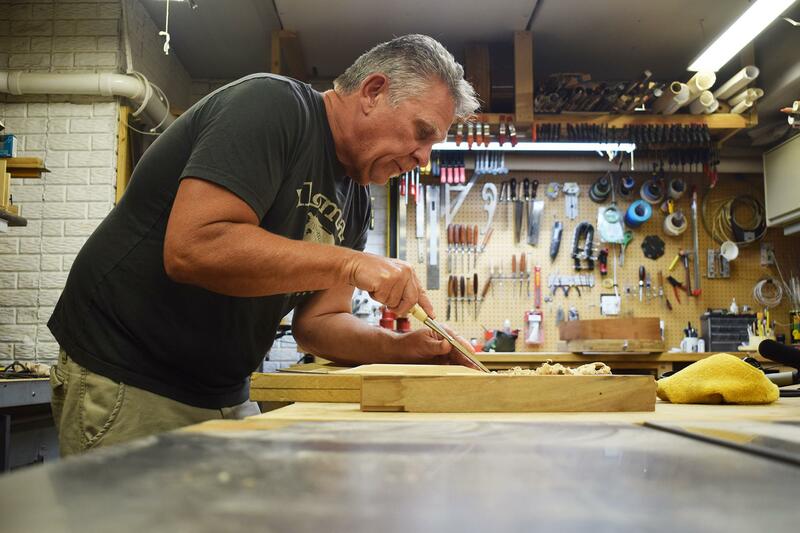 He uses a belt sander to get the guitar’s back and sides down to the ultra-thin eighth of an inch. He’s got a custom press he uses to bend the wood for the guitar’s sides; that’s done with a silicon thermal heating blanket and some steam. It’s a delicate process, like a science experiment. And yes, it’s happened: He’s nearly finished a guitar, only to find a crack and double-back to fix it. “The one thing this has taught me is patience. Because there’s a lot of really intricate work and very small tolerances in the construction of these things. So you really, really have to take your time and be patient. You can’t get in a hurry at all. And that’s been a really good lesson for me, because I’m not a patient person,” Neal chuckled. Maybe his favorite part is the wood. The way it feels, the way it smells. That’s the first thing you see when you step into his shop—a rack filled with all different species of wood. He even once made a guitar for someone using wood that had been in that family’s barn for 40 years. He mostly sticks to about five different styles of guitars. His latest creation, called the Modern Dreadnought, is a total original. It's modeled on a traditional Martin Dreadnought guitar. But Neal softened the upper shoulders of the guitar’s shape, so it's more rounded. It's punchy, he said, like an old 1930s Martin guitar that became a favorite of bluegrass players who wanted to play louder than the banjo. It's made from a south American hardwood—a Bolivian rosewood. “I want to be known for guitars that people want to play. Some builders really build for the aesthetic value. And not to say they’re not good-sounding, good-playing guitars, but they put a lot of extra shiny things on them,” Neal said. 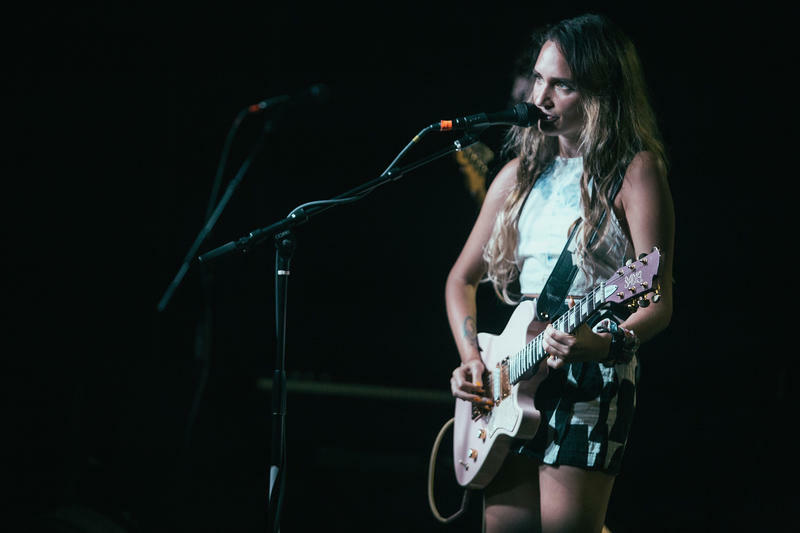 “(Some) people buy custom guitars and spend a lot of money for them—they don’t want to take them out on an open mic night, or sit at a campfire and play that guitar cause they’re afraid something will happen to it. I want people to play my guitars when I build them. That’s why I build them. Not to hang them on the wall. “I build them so people will play them. And enjoy them,” he said. 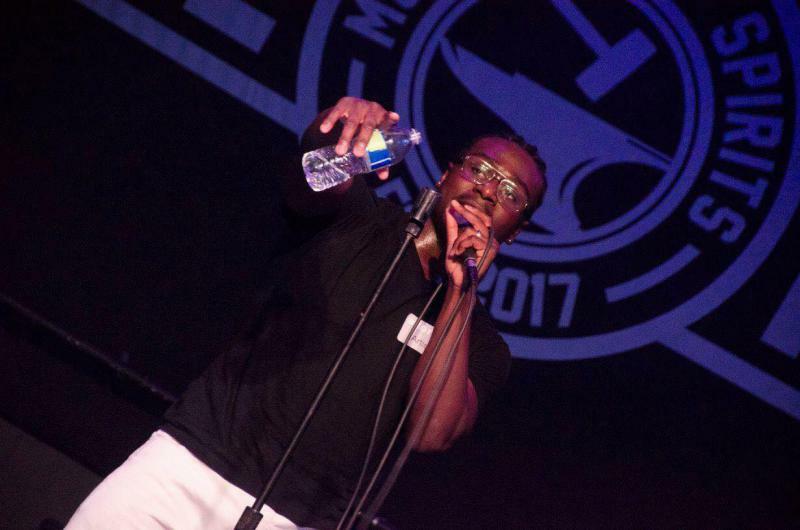 Bloomington hip-hop artist Dominique Stevenson said positive messages and uplifting vibes in his music are connected to his religion. He doesn't believe people can achieve happiness, or good, alone. A new take on an old Irish proverb: Original music is like a four-leaf clover—hard to find and lucky to have.